They came from all over. Men, women and even children converged on the Arena - a sports venue that was transformed into a gigantic Knesyah leShem Shomayim, where the voice of Torah and Tefiloh was uninterruptedly heard from the early hours of the night until the early hours of the following morning. Buses arrived from all corners of the country: Haifa and Kiryat Gat, Tel Aviv and Giv'at Zev, Bene Beraq and Komemiyus, in addition to the many private vehicles that filled the parking to capacity. It was a sight to behold how over ten thousand people entered the compound in an orderly fashion and managed to find their seats in record time, all due to the finely tuned planning skills that Merkaz Belz - the pulsating core of Belz institutions - is known for. The reason for this jubilee was not a celebration of a mere milestone, it was first and foremost an opportunity for like-minded people to gather in one location and offer thanks to the Al-mighty, to pray for one another and to gather strength to continue the work that was started all those years ago. It was also the culmination of fifty years since Belz Chasidim have merited to have one of our generation's greatest builders of Yiddishkeit as their Rebbe. But first some historical background: By grace of HaShem, the holy Rabbi Aaron ZTZ"L, who - together with his brother, the current Rebbe's father - were plucked from blood-soaked Europe and after many trials and tribulations arrived to the relatively safe shores of the Holy Land. It was under their leadership that after the war Belz started to rebuild and when the time came, the Chasidim appointed the current Rebbe to lead them in the ways of Torah, Tefillah and Chassidus. 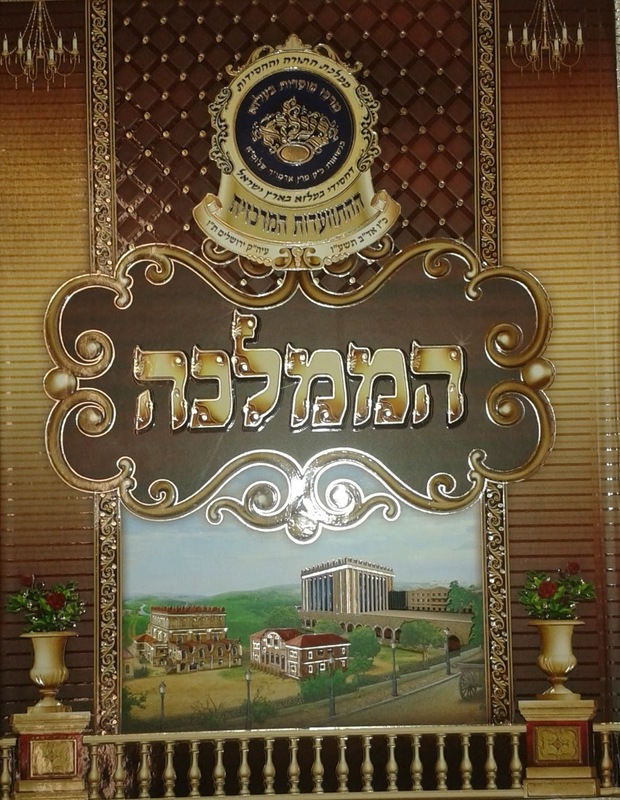 By Hashgochoh Protis, this event was held a mere week from when the Rebbe Shlita together with his son Harav Aron Mordechai attended the Bris of the fourth generation, their great- and grandchild, a son to Harav Hershel - a historical first in the court of Belz. The speakers didn't hide the fact that one of the reasons for this auspicious event was to raise the profile of the Belz educational facilities, which suffer from a chronic lack of resources. To prove the point, there were slides and videos which attested to what Belz achieved in quality as in quantity, both locally and on an global scale. Indeed, the fact that the tables of honour were filled with donors who flew in from the world over, to put their money where their mouth is, indicated that there are Yidden for whom Belz represents the ideal goal for their support and charitable actions. As a sign of appreciation, they were presented by the Rebbe with a memento in the form of a silver goblet, which will surely adorn their Seder table. One of the speakers, the world-famous Badchan Rabbi Yisroel Stern delivered a heart-stirring rendition of prose, describing famous historical facts of the Belz dynasty. 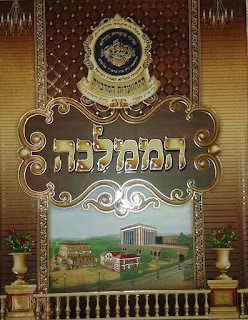 During one of the interludes, Reb Yisroel regaled the assembled with reminisces that he managed to hear from the elders in the Belz community of previous generations and highlighted the fact how we're missing one of the main pillars of Belz in the past fifty years Rabbi Ovadyah Rumpler Z"L. The sad news that another field-marshal of Belz was Niftar that day, the venerable Rabbi Dovid Elimelech Galitzki who led the Belzer community in Antwerp, Belgium as Gabbay and Rosh HaKohol, cast a shadow on the event. One of the main features was the Belz boys' choir, of which some members came all the way from London. The songs - some of which were composed especially for this momentous occasion - brought the attendees to their feet and lifted the whole Arena a Tefach in the air. Whilst Belz London was amply represented, there were many overseas guests from the Americas, Europe and farther afield. The highlight of the event was when the son of the Rebbe Harav Aron Mordechai rose to speak in the presence of his father, who thanked him profusely upon the completion of his emotion-filled speech. The keynote Drosho by the Rebbe held the assembled in awe, by the depth and breadth of its relevance, emotions and teachings - a veritable Shiur in how to live life as a Chosid, especially as a Belzer Chosid. This event will be remembered by Belzer Chasidim as a night of Simchah and tears, Achdus and song - at times it seemed as if the roof would cave in from the outpouring of pure holy joy and then there was the time when the earth was about to give way, by the sad memories of those Belzer Chasidim who - alongside Klal Yisroel in Europe - perished in the inferno of the Shoah HY"D.
First published on 15 April 2016, on Jewish P.O.S.T. - the Jewish Voice for the People Of South Tottenham (this Blog is now defunct).